The second of three Avon paperback editions of Listening Woman to come out in 1979, and the first of two printed in Canada. The cover design, unattributed, is dominated by a foreground filled with broken aviator glasses, a coral snake, and a wad of bills. In the background, the sun sets behind a rocky outcropping, in front of which sits a helicopter. 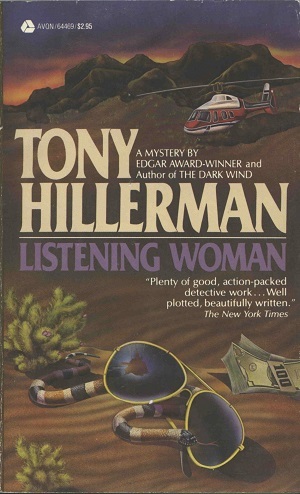 Of note is the cover's reference to Hillerman's receipt of the Edgar Award, something not mentioned on the cover of the American print edition but that is shared with the third Canadian print edition. The upper left corner is the only thing that changes between the two covers printed in Canada, with the most marked change being the change in price. This novel shares its contents template with the Avon edition printed in the US, with minor additions, whereas the interior fly and end pages of the second Canadian edition differ greatly from both the US and first Canadian editions. Binding: Pasteboard with full color illustration on front cover; back cover includes detailed inset from front cover.